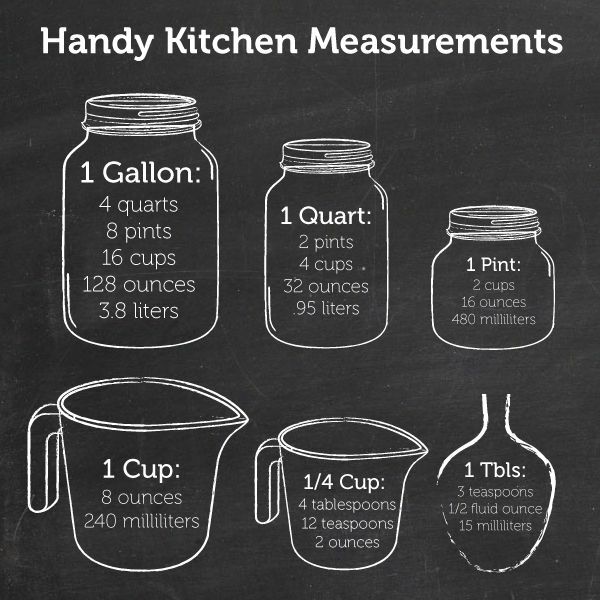 Please note that these are conversions from U.S. American cups, which are equivalent to 240 milliliters. During my research into this topic, I discovered that elsewhere in the English-speaking world, such as in England, Australia and New Zealand, 1 cup is equivalent to 250 ml. You can find more information on conversions here, here, here, here and here. While I have tried to be as accurate as I possibly can here, measuring with cups is, in and of itself, highly inexact, depending on how tightly you pack the ingredients into the cup, intentionally or not, and so there is no definitive answer as to exactly how much one cup of flour, for example, weighs. I also took the liberty of rounding some conversions for convenience sake. Measuring using a kitchen scale will give you the most accurate and consistent results in your baking. Please don’t hesitate to contact me if you find an error in my calculations, if I didn’t include what you’re looking for or if you have any other questions about conversions. Graphic used with permission from Duncan Hines. All-purpose flour: white wheat flour. I use Weizenmehl glatt Typ 700 in Austria (which is Typ 550 in Germany). Baking powder: is available in Austria as Backpulver. Baking soda: is called Natron in Austria and can be found in the spice aisle. Brown sugar: brown sugar gives dough a caramel flavor, light brown color and chewy texture. While American brown sugar is best for American recipes, you can substitute Demerara fine brown sugar, which can be purchased at most supermarkets in Austria. Buttermilk: if you don’t have buttermilk on hand, you can make it using regular milk and lemon juice or vinegar. For 1 cup of buttermilk, use scant 1 cup (240 ml) of milk, add 1 tablespoon of lemon juice or vinegar and stir. Let mixture stand for 5-10 minutes until thickened before using in your recipe.ml) of milk, add 1 tablespoon of lemon juice or vinegar and stir. Let mixture stand for 5-10 minutes until thickened before using in your recipe. Cake flour: to make one cup of cake flour, put one cup (140 g) all-purpose flour into a bowl, take out 2 tablespoons of the flour (put it back in the bag) and add 2 tablespoons cornstarch. Sift the flour and cornstarch together. Chocolate chips: use real chocolate chips if possible when making Chocolate Chip Cookies or using other recipes titled “Chocolate Chip” anything. Why? Because American chocolate chips don’t just contain chocolate, they also contain additives that help the chocolate chips keep their shape and not melt away when baked. If the chocolate chips are to be melted as for a ganache or a chocolate glaze, go ahead and substitute semi-sweet baking chocolate. Corn syrup: agave nectar, sugar beet syrup, honey or maple syrup can be substituted in many recipes. You can also try making your own corn syrup substitute using the recipe here. Cream cheese: I’m including cream cheese on the list here because European cream cheese is not equal to U.S. cream cheese! Not even Philadelphia brand! European cream cheese is a cream cheese spread. It is fine for making cheesecakes, as long as you are aware that it contains more liquid than American cream cheese and you omit any additional liquid there is in the recipe, such as milk or sour cream. You may also need to increase baking time slightly. If you want to make Cream Cheese Frosting with European cream cheese, there is an easy method to follow: How to Make Cream Cheese Frosting with European Cream Cheese (or Cream Cheese Spread). Cream of tartar: in baking recipes, you can substitute regular baking powder (Backpulver) for the cream of tartar and baking soda amounts although the baked goods won’t be quite as tender. Weinsteinbackpulver is available in Austria and it contains both cream of tartar and baking soda. For baking recipes, use double the amount Weinsteinbackpulver as cream of tartar is called for and half the amount of baking soda called for. (For example: if the recipe calls for 1 teaspoon cream of tartar and 1 teaspoon baking soda, I substitute it with 2 teaspoons Weinsteinbackpulver and ½ teaspoon baking soda. Alternatively, you can substitute both with two teaspoons baking powder.) When cream of tartar is used to help stabilize beaten eggs whites (i.e. for a meringue), you can substitute 1/8 teaspoon of vinegar or lemon juice per egg white. Or omit the cream of tartar, making sure to beat the egg whites thoroughly. For frostings, candy and syrups, you can safely omit the cream of tartar in most cases. Evaporated milk: is available as coffee milk (Kaffeemilch-Maresi). Graham crackers: just about any cookie can be substituted for graham crackers in crusts for cheesecakes. Vanilla wafers, shortbread cookies, gingersnaps, digestive biscuits in the UK, Butterkekse or, even better, Vollkornbutterkekse in Austria. Oats, quick or instant: oats have been cut and rolled into fine, tender flakes. These are labeled as Haferflocken zart or Kleinblatt. Oats, rolled or old-fashioned: whole grain oats that have been rolled or pressed into regularly-shaped flakes. Haferflocken kernig or Großblatt in Austria. Oats, steel-cut: the groat (grain) is not rolled flat, rather it is cut into pieces. Haferschrot or Hafergrütze, but is hard to find in Austria. Peanut butter: use industrially-prepared peanut butter in baking recipes to avoid any texture problems. I prefer Skippy brand (creamy), which you can find in some supermarkets here. Powdered sugar: use Puderzucker. Austrian Staubzucker may be substituted but it isn’t as soft and fine as Puderzucker. When using Austrian Staubzucker for frostings, I usually pulverize the powdered sugar on high in the food processor for one minute to prevent a grainy texture in the frosting. In a pinch, you can also make your own powdered sugar from granulated sugar using this method. Pumpkin puree (canned pumpkin): make your own, see directions here. Self-rising flour: use all-purpose (white) flour and add 1 teaspoon baking powder per 1 cup (140 g) of flour. Shortening: 100% vegetable fat that is solid at room temperature. Kokosfett is your best substitute; margarine may be substituted in a crust or dough recipe. Sweetened condensed milk: this is available in Austria as gezuckerte Kondensmilch from Nestlé. Topfen (Quark): farmer’s cheese (USA) OR blend equal parts cottage cheese and cream cheese OR combine 2 parts ricotta with 1 part sour cream. Unsweetened baking chocolate: use dark or bittersweet chocolate which contains 80-90% cocoa. Unsweetened, natural or “Dutch-processed” cocoa powder: is available in Austria as Kakao or Kakaopulver. Vanilla extract: I use my own homemade vanilla extract but you can also use vanilla sugar, which is widely available in stores here, or Flüssiger Vanille Extrakt, which comes in tiny bottles.